Everything Evil says makes sense in a post WWII America, which was a thriving Economy with sufficient oversight and regulations to transition into this UBI and spreading the riches around to use a common phrase. Now, the chasm between this theoretical policy and what is happening is so incredibly wide. The Stock Market has morphed into a true gambling den for the rich even while giving some relatively meager morsels to the masses. Predatory lending has been the norm for some time. That is because lending is way too profitable to exclude almost anyone. If a Banks makes a bad loan it hardly faces any negative consequences. Either the debtor is forced into bankruptcy Court and still forced to pay off his loan or the Loan is sold off in the Stock market in some exotic derivative instrument or junk bond or whatever, so the original Bank passes off the danger of being left with a loan defaulted on. At a deeper level, I do believe that the Big players know that the inherent presumption of modern day Capitalism that growth must and will take place in the Economy is NOT compatible with the now evident limits to growth and poor economic fundamentals. This is partly due to structural deficiences which Capitalism itself has facilitated in coming about. Deficiencies such as low wages, too many part time jobs, not enough domestic job opportunities etc. All this a product of seeking a greater return at the expense of the workforce. But also, limits to growth as the energy system is no longer allowing as much Net Energy into the greater Economy. As certain resources are more difficult and expensive to obtain and as whole countries are forsaken and exploited to the whims of a voracious elite wealthy class leaving less for the masses. So in summary, the rift between the ideal and the actual is getting ever wider. The average person ought to have a better understanding of what risk means to them, and within the economy. The average person would have to care. Most people are largely reactionary, not really focused on 'understanding'. I wonder what the Fed will use as a target for when to raise rates when they don't have workers to kick around anymore? I mean, it's obvious they will have a problem. Currently, the Fed uses the cost of workers to determine when to raise rates. Even without inflation, they foresee workers being able to bargain for higher wages in a low unemployment environment, so they begin to raise rates. They can't have companies borrowing more, all companies borrow, in order to finance higher worker costs. That might expand the money supply too much in relation to borrower's ability to pay too fast, with both companies and workers borrowing against the same set of expectations. Inflation is actually always at work, but the Fed doesn't want the rate it increases at to cause it to develop into a wage/price spiral. With the Fed acting, facing the cost of higher rates and paying workers companies choose to cut worker costs. They may also curtail borrowing in relation to other operations. This has an impact on borrowing from the worker end as well. Some workers who took out loans won't repay them. Others won't take out loans in a more uncertain environment. All of that lessening of borrowing serves to shrink the rate of growth of the money supply. It makes sense, but what will they use when the cost of workers, since there will be so many fewer of them as artificial intelligence becomes more common, is no longer such a hindrance to company profits? My guess is that they will take a look at how easy it is for a new company to join certain oligopolies. evilgenius wrote: I think that as long as they create money and don't lose the faith of the people in the value of that money, they can create as much as they like. They also say that the problem with doing that is that it may create inflation. Private banks create money, not the government or central banks. Also, they are not actually constrained by reserve requirements because central banks will create as many of those reserves as the banks need to fulfill these requirements. And there is *massive* inflation. Take a look at the US money supply: it has quadrupled since 2000. Where did it all go? Massive inflation is called a rising stock market (and other bubbles). Because private banks decide when to create money, how much and for whom. What's always been known as the money multiplier has been a number attached to government spending, to understand how many times a dollar introduced into the economy had an impact beyond that initial introduction. The problem is that there *is no money multiplier*. The whole concept of an MM is based on the idea that banks can only lend money when customers have deposited money first. Which is not true at all. Apparently it's still being taught in some economics courses even today, but that only hides the fact that the control of the money supply is privatized and almost unregulated. onlooker wrote: If a Banks makes a bad loan it hardly faces any negative consequences. Either the debtor is forced into bankruptcy Court and still forced to pay off his loan or the Loan is sold off in the Stock market in some exotic derivative instrument or junk bond or whatever, so the original Bank passes off the danger of being left with a loan defaulted on. Or even simpler: the bank creates an offshore subsidiary, away from prying eyes, and transfers the bad loan to it as an asset carried in the books at full value. Done at a massive scale after 2008. It goes only to 2009 and includes only the big mergers. 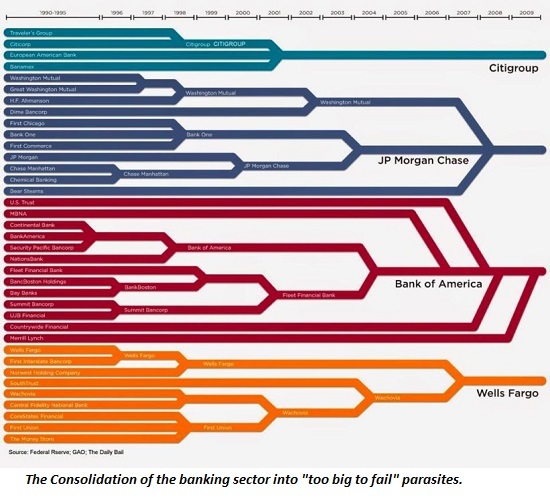 But how many US banks went under after 2008? A hundred? More? Some disappeared, more were taken over by the big banks. Who grew even bigger as a result of the crisis. Zarquon wrote: but that only hides the fact that the control of the money supply is privatized and almost unregulated. But this has always been like this, hasn't it. Wow Z, I didn"t know amlbout that. Sounds almost like a criminal enterprise creating some front company to take on its laundered money. onlooker wrote: Wow Z, I didn"t know amlbout that. Sounds almost like a criminal enterprise creating some front company to take on its laundered money. Oh, it's perfectly legal. One German bank hid all its bad real estate loans in Ireland, where it didn't have to report to the German regulators, thus keeping them off the books. Then they installed an ambitious guy from middle management to run it (nobody else wanted the job). He started to gamble, big time. When it all went pear-shaped, the cost to the taxpayer was over 100 billion €. And they all did it, and they all knew it. Why do you think banks stopped lending to each other after '08? Modern Money Theory is about something more than blaming the banks and scattering into the dark corners of conspiracy theory for answers. The bankers are guilty, but this isn't about that. It is about the idea that governments can create money. They only sell bonds in order to quell rates dropping to zero, not to finance their operations. They sell bonds in order to quell inflation. They could issue money outside of selling bonds, but the increase in the money supply, coming as it would without context to the activity of business, having no connection to the needs of such, would probably be disastrous in terms of inflation. The fault I find with the theory is that it doesn't address how the bank's ability to create money links the supply of money to the economic activity of man. I'm not denying that banks create money. Far from it. What I am saying is that there isn't a market by which such a point of equilibrium can be arrived at under the theory. It would work in a pinch, under some kind of collapse, but it would drift away from meeting the entrepreneurial spirit at the point where the game meets the real world. They only offer solutions to a static world in which there isn't much innovation, or failure. So far, its proponents haven't offered any explanation as to how they would get around that. And the glaring fault I find is how Lending has gotten out of hand. Via fractional reserve banking and fiat money, yes Banks literally can create money out of thin air. As has been noted, the demand for the dollar has been tempering inflation. But this system grossly distorts the true Economic picture. It finances activities that probably have no business in being financed. It also inflates unrealistically asset prices. It is basically being used in lieu of the Economy being able to finance itself organically without huge levels of lending. So, we have a System basically masking the underlying unhealthy economic conditions and fundamentals. That all this money being created by the Central Banks is not tied to anything substantive just exacerbates the unsustainability and risk of this entire venture. When scarcity induces inflation, or consumers go under from Debt or interest rates rise to try and introduce some balance into the dynamic, or the Stock Market get jittery and sell off ensues, the whole Debt matrix will collapse and with it any semblance of a healthy Economy. It has proven durable and resilient because all the rich countries are playing the game. And because they All realize that they cannot bail out on this Fiat money system. So Debt accumulates and thus the burden on current Debtors and future generations. But since we live in a live for TODAY society, we heed not the future and that is plainly clear across the gamut of human activities. Well the future will become the present at some point. The stock market is too big in relation to everything else. Probably, the Fed ought to say they will consider raising rates every other quarter, though still raise. Alternatively, they could stop selling their bond war chest for the time being, in order to slow the grip of their efforts to crush things to a manageable rate for those who need to get out of growth stocks. A run up like the one we've seen since the last crash is bad when it means that absolutely everyone is in growth stocks. Those with controlling interests, the 1%, will be fine if the thing tanks. Their share is large enough that they won't suffer a hand to mouth existence if the market capitalization of their interests shrinks. Then they can buy up what's now devalued. Everybody else would be in trouble. “When central banks create money, they do so for a long-term public purpose. They fund government spending and capital investment and public infrastructure. In most countries in the world, public infrastructure, roads, communication systems, railroads, water and sewer systems have all taken a capital investment that is larger than all the manufacturing capital investment. In the United States, the value of New York’s real estate, alone, is larger than the value of all of the plant and equipment in the United States. The result is: The textbooks that are taught in the United States ignore this difference that we have been talking about. There is a formula, MV = PT. It means an increase in the money supply increases the price level. But the price level that the textbooks talk about are only consumer prices and commodity prices. Nowhere in the textbooks do you find a relation between the credit supply and asset prices, real estate, stocks and bonds. And, yet, 99% of the credit spent in the United States economy is spent on these financial claims. Every day an amount equal to the entire year’s gross national product passes through the New York monetary clearinghouse and the Chicago Mercantile Exchange. The vast amount of payments are within the financial sector. And, within the last ten years or so, all of the growth of bank lending is to other financial institutions. In the textbooks there are happy pictures about banks lending to industry to build machines and factories with a smokestack coming out and employing labour. But this is a fiction; this is not what occurs in practice. All of the increased capital investment in the United States economy comes from the retained earnings of corporations—not from banks. Banks do not lend to bring new capital investment into existence. They lend against mortgages, against capital in place, against real estate, against assets that already exist—not to create new assets." Zarquon wrote: “When central banks create money, they do so for a long-term public purpose. They fund government spending and capital investment and public infrastructure. In most countries in the world, public infrastructure, roads, communication systems, railroads, water and sewer systems have all taken a capital investment that is larger than all the manufacturing capital investment. In the United States, the value of New York’s real estate, alone, is larger than the value of all of the plant and equipment in the United States. This is misleading. The CBs have formal criteria rather than "long-term public purpose" that every person could interpret in their own way. Real estate is a financial asset and the comparison is void. A dry oil rig can have 0 or even negative value, because it is dry, despite of the costs to produce and mount it. Same with real estate. "And, yet, 99% of the credit spent in the United States economy is spent on these financial claims. Every day an amount equal to the entire year’s gross national product passes through the New York monetary clearinghouse and the Chicago Mercantile Exchange. The vast amount of payments are within the financial sector. And, within the last ten years or so, all of the growth of bank lending is to other financial institutions." This is true but not sure why every time this point is picked, it is discussed with some form of veiled condemnation of whoever who can be condemned. This is a deadly natural state of events and it follows from the money-goods-money' formula, or any similar formula that any sane individual follows as guiding principle of managing their financial affairs. Who is to condemn?